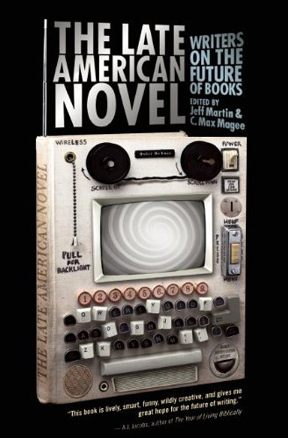 A review written in 20 minutes shortly after reading Jeff Martin and C. Max Magee’s anthology, The Late American Novel. It remains unclear whether Jeff Martin and C. Max Magee will, in five years time, be paid by Chris Anderson (or some other dimwitted man who plagiarizes from Wikipedia and hosts conferences and edits overrated magazines and pays quirky and interesting voices a lot of money to transform into uncritical hacks in a few years) to do something in relation to books and marketing. But I don’t think they will. Jeff Martin and C. Max Magee are certainly more admirable and interesting in their 2011 pursuits than Kevin Smokler was with his 2005 pursuits. Looking at the list of contributors in The Late American Novel, there are only three names that make me want to throw the book against the wall and rage like a deranged animal for another random anthology so that I can peform the same eccentric test. And I have to say that, as anthologies go, this is a pretty decent batting average. I think there were more contributors who annoyed me in Bookmark Now. I’m not sure I needed Thomas Allen’s “Notes on the Cover.” If you have to explain your book cover, it’s my feeling that you’re slumming it in some way. I also didn’t need Reif Larsen’s “The Crying of Page 45.” Larsen, who has littered this essay with annoying postmodernism (“Figure 3: The order of Chapters in Cortazar’s Rayeula“) didn’t get the memo that, thanks to the twee approach of McSweeney’s, pomo will be quite dormant for the foreseeable future. “I never arrived at page 45,” writes Larsen. And one longs to tell this precious writer that he’s not exactly making it easy to push beyond the third paragraph. One also wishes to tell Larsen that nostalgia is a terrible reason to read. One reads to get some sense of being alive. Or at least this reader does. Which brings us to Marco Roth’s “The Outskirts of Progress,” with its second-person East Coast assumptions. First off, Marco, I may be skeptical, but I’m not pessimistic. Like you, I’m not a slave to technological progress. But unlike you, frequent railroad landscapes do not bore me. I also quibble with your suggestion that I am deracinated. I was just watered and taken for a walk. No knowledge is lost, if one looks hard for it. Please take more time formulating your thoughts. The widely disseminated Davey Gates-Johnny Lethem exchange from PEN America (collected here as “A Kind of Vast Fiction”) is something one can get behind, especially in response to Gates’s idea about the “instantaneous opinion marketplace” and whether all future novels are, in some sense, historical. But then my own long-winded online presence would suggest that Gates and I are simpatico on this score. I also liked Deb Olin Unferth’s “The Book,” in which bullet points demonstrate the futility of attempting to announce the death of a medium. Elizabeth Crane humbly writes, “So I’m the last person to have any predictions about the fate of fiction in the future. Are there any original ideas anymore?” Hucksters and e-cult members: take note. That’s a bit like referring to “flyover states.” It’s impolite. Maybe going to Fresno might give some of us a more reasonable idea about where books are heading and what regular people are reading. The Late American Novel, while refreshingly cheerful, doesn’t quite acknowledge this. But then neither did Bookmark Now. Rudolph Delson is wrong to suggest that there isn’t pleasure in knowing about novels. That’s like saying there isn’t pleasure in knowing about people. We should know about everything. But perhaps The Late American Novel is a necessary kickstart. I assure you Wired is not “overrated.” Even the Italian version isn’t. Sir, you impress me greatly. I don’t even know how I found this site, but I find myself reading it more and more frequently. I am assuming you share my opinion of Dave Eggers and I think something can get under your skin even if you don’t have a soul, cuz what does the soul have to do with skin? But, personally, I don’t believe in soulessness, just as an aside.